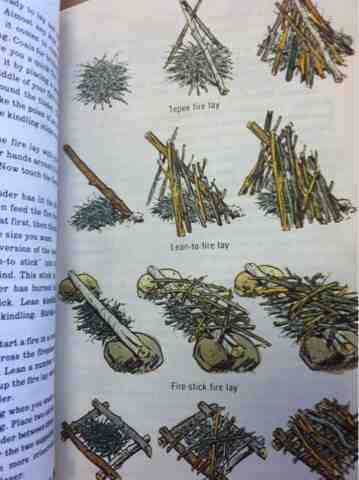 Found on page 112 of the 1980 copy of the Boy Scout Handbook: Here are nine different types of fire lay. 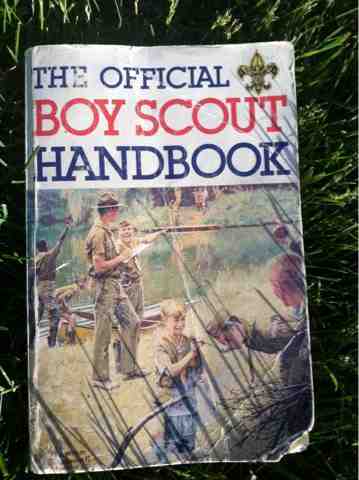 Throughout the years, many items change within the different printings of the handbooks, manuals, merit badge books, and fieldbooks. One topic stays constant is the three materials you need to make fire. This last week we were on the troop summer week long scout camp up in the High Uintas of Utah. As we were hiking along between Trident and Beth Lake, I noticed that there was a ton of lichen on all the rocks. I realized that I did not know anything about lichen, except that it is usually found growing on the rocks. So, here is a few thing that I have found from my research. Smokey was born on August 9, 1944. The U.S. Forest Service wanted a spokes person to continually remind people that "Care will prevent 9 out of 10 fires", and the fictitious bear was just the ticket... as they said back then. In 1947, Smokey's message changed to the familiar "Only YOU Can Prevent Forest Fires". Here are some tips to do your part in keeping your campsite bear free. Found on page 224 of the 1959 6th edition of the Boy Scout Handbook, the Outdoor Code reminds us of America's natural resources and how to conserve them. One of my applesolute foods to eat while backpacking is apple leather. For the most part, making these roll-ups of dehydrated fruit is extremely easy. From the 4th edition of the Boy Scouts of American Handbook printed in 1939, page 488 offers some great tent handicraft projects. Usually made out of canvas, these tents were very basic, but effective designs for scouts to build themselves. For the most part, Scouts now a days do not know the art form of making your own tent. Instead, with prices being so low, it is more cost effective and easier to just go to the store and purchase your three man, nylon, waterproof tent for about twenty five dollars. A fun and less expensive variation, if looking at experiment in making your own tent, is using tarps. Open Outing Tent With Hood -- This can be made from thirteen yards of 8 oz. duck canvas, which costs very little. A Tent For Mosuito Country -- Offered by the editor as being especially adapted for use in mosquito country in hot weather. Tent has florr cloth and weather flaps over cheese-cloth windows, and two puckering-string round doors, also with flaps. One of the most needed necessities while camping is light when it is dark. One trick that I learned was how to make a lantern using only a headlamp and a clear water container. The process is simple; place the light directly on the side of the clear water container. Just make sure that there is water inside the container. I personally like to use an old milk jug so I can have a handle when walking with my newly created lantern. I take a bag of these fire starters with me on every camp out and hike. Extremely easy to make, easy to use, and light to pack. Completely coat the cotton ball with the petroleum jelly. Make about 10 per plastic bag and store within your pack. Always remember to use your best judgment when working with fire. Tepee Fire Lay. This fire is great for a quick, hot fire. Place a handful of tinder in the middle of your fire ring and circle kindling in a circle facing up. The center of the sticks should come together forming a tepee. Lean-To Fire Lay. This is a modified version of the Tepee fire. Push a green lean-to stick into the ground with the tip pointed into the wind. Lean the kindling on both sides. Fire Stick Fire Lay. Place your fire stick down and pile your tinder on top. Lay a number of kindling sticks against the fire stick. Build up with thicker and thicker fuel. Ignite the tinder. Crisscross Fire Lay. Perfect for getting quick hot coals. Place two sticks on the ground parallel to each other. Put tinder them. Then lay thin kindling sticks crisscross over the two supports. Continue with more layers. Increase thickness from layer to layer. Cooking this meal can complete requirements for the Cooking Merit Badge along with your rank advancements. This is a favorite for my scouts on camp-outs. Needless to say, we do not make this while backpacking. Build a campfire and allow the fire to burn until it has accumulated a bed of coals. Or use charcoal briquettes. This is a great campsite for winter camping with younger scouts. Located just five miles off of highway 6, Diamond Fork offers year round camping with the North loop being open during the off season winter months. This campsite includes bathroom facilities, picnic tables, fire pits, a creek that runs along the perimeter, and nature trail loop. During the winter months snow caves are able to be made along the bottom of the hillsides to the east of the campsites. Whiting Campground is located in Maple Canyon, just 3 miles from the town of Mapleton, Utah, at an elevation of 5,400 feet. Visitors enjoy hiking, mountain biking and horseback riding. A dense, shady grove of maple and cottonwood trees provides pleasant shade and beautiful fall color. Summer wildflowers are plentiful. A perennial creek runs along the campground. Maple Canyon Trail, for hiking, mountain biking, dirt biking and horseback riding, begins nearby. It leads to a small network of trails with scenic mountain and canyon views. The campground contains group, single-family and equestrian sites. One group site can accommodate up to 100 people, the other up to 200 people. Both sites are equipped with picnic tables, grills, campfire rings and cement site pads. Single and equestrian sites have picnic tables, campfire rings and cement site pads. Equestrian sites also have hitching racks. Vault toilets and drinking water are provided. When camping in cold weather, being wet can drop your body temperature down extremely fast. One way to stay dry and warm while winter camping is to dress in layers. Layering is a combination of clothes to regulate your body temperature. Layers are broken down into three categories. Inner, Mid, and Outer. Mid Layer - this layer needs to stay in close contact to the inner layer but not be baggy. I usually use a fleece jacket for my mid layer. Outer Layer - this layer also needs to not be baggy and should be rugged to withstand the elements. Below are some examples of the three categories - Stay Dry and Warm!